Editor’s note: This is one of those pieces we see as required reading for leaders and board members of nonprofits and philanthropy. It is basic business intelligence that should help inform our work and strategies. The Bureau of Labor Statistics is providing real data on nonprofit organizations here, including employment, wages, and the number of establishments. It even provides a look at how nonprofit jobs are distributed geographically and what proportion of the jobs in particular fields are nonprofit. These new data provide insights into this important segment of the U.S. economy. Nonprofit employment, total annual wages, and the number of establishments grew steadily each year from 2007 through 2012, even during the 2007–09 recession. By contrast, these three measures were much more volatile over the 2007–12 period for the total private sector, with employment declining by 3.0 percent over the period and nominal wages and the number of establishments growing much slower than in the nonprofit sector. In October 2014, the Bureau of Labor Statistics (BLS) released a new data series on nonprofit organizations covering the period from 2007 through 2012. BLS frequently receives information requests for this segment of the labor force. This new data product offers important insights into this cross section of the economy. Many different types of organizations receive tax exemptions from the federal government. Section 501(c) of the U.S. Internal Revenue Code (26 U.S. Code) specifies 29 different classifications of nonprofits that are exempt from some federal taxes. These different categories include civic leagues and social welfare organizations (501(c)(4)), chamber of commerce and business leagues (501(c)(6)), and organizations of past and present members of the U.S. Armed Forces (501(c)(19)). The most common type of nonprofit is section 501(c)(3), with more than 2 out of every 3 nonprofits falling into this category. This classification includes establishments engaged in charitable, educational, literary, animal welfare, child welfare, public safety, religious, or scientific pursuits. The new BLS research data are restricted to this class of nonprofits in the private sector. Data on the nonprofit sector have many uses. 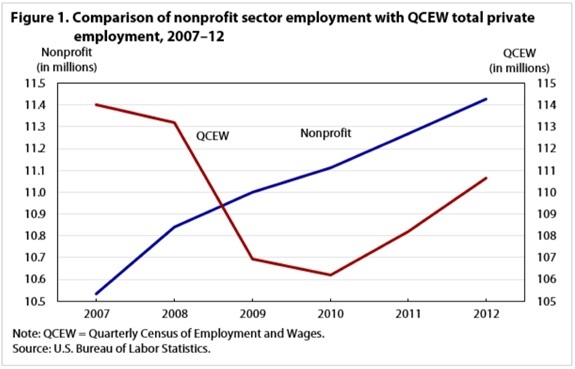 Government agencies estimate nonprofit employment and wages as important inputs in their statistics. The Bureau of Economic Analysis currently uses an estimate of nonprofit data in their gross domestic product (GDP) calculations. The BLS Office of Productivity and Technology also uses nonprofit data when developing its productivity data. Private sector groups also have a keen interest in nonprofit data. Over the years, researchers from Johns Hopkins University and the Urban Institute have produced numerous studies on section 501(c)(3) nonprofits by using publicly available Internal Revenue Service (IRS) nonprofit data as well as employment and wage data from the BLS Quarterly Census of Employment and Wages (QCEW) program.1 BLS built on and enhanced these approaches in developing this data series. BLS combined existing QCEW microdata with publicly available IRS records on nonprofit institutions to produce these new research data. Utilizing the existing QCEW data sources avoided any increased respondent burden. The resulting research data measure employment, wages, and the number of establishments for 501(c)(3) nonprofit organizations. These new research data series on nonprofit organizations or sectors were developed with the use of two existing data sources: the QCEW microdata and the IRS Exempt Organization Business Master File. The Quarterly Census of Employment and Wages. The QCEW data are the product of a federal–state cooperative program. The data are derived from summaries of monthly employment and total pay of workers covered by state and federal unemployment insurance legislation. The reported unemployment insurance summaries are a result of the administration of state unemployment insurance programs that require most employers to pay quarterly taxes on the basis of the employment and wages of covered workers. Each quarter, every business with an unemployment insurance-covered employee is required to report monthly employment, quarterly wages, and unemployment insurance contributions to their respective state. State law mandates these data reports. Thus, the QCEW has extremely high coverage rates. 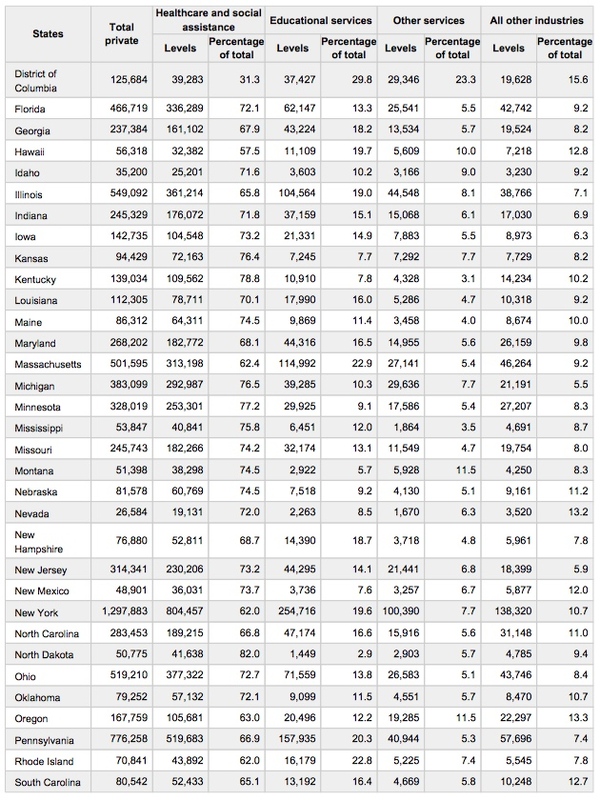 Employment and wage data for workers covered by state unemployment insurance laws are compiled from quarterly contribution reports that employers submit to the State Workforce Agencies. Federal civilian workers are covered by the Unemployment Compensation for Federal Employees (UCFE) program. Employers not only must submit the quarterly contribution reports, but employers who operate multiple establishments within a state also must complete a questionnaire called the “Multiple Worksite Report,” which provides detailed information on the location and industry of each of their establishments. The Multiple Worksite Report is the only detailed report covering individual worksites for multiple-establishment businesses of its kind. Its quarterly inclusion in the QCEW supports its accuracy for all levels of industry and geographical detail. QCEW data are derived from microdata summaries of employer reports of employment and wages that states submit to BLS; in 2012, these reports covered 9.1 million establishments. Major exclusions from unemployment insurance coverage include self-employed workers, most agricultural workers on small farms, all members of the U.S. Armed Forces, elected officials in most states, most employees of railroads, some domestic workers, most student workers at schools, and employees of certain small nonprofit organizations. Internal Revenue Service. Information on nonprofits is publicly available from the IRS. Businesses wishing to obtain recognition of tax-exempt status by the IRS must submit a request to the IRS on Form 1023, Form 1023-EZ, or Form 1024. Information that is collected on these forms includes, but is not limited to, the Employer Identification Number (EIN), primary name of the organization, address, a subsection code stipulating the type of tax-exempt status, asset and income figures, and a description of the activities of the organization. Nonprofit data from Forms 1023, 1024, 1023-EZ, 990, and 990-EZ are maintained and made public through the IRS Exempt Organization Business Master File. The Exempt Organization Business Master File is a large cumulative dataset that is updated monthly. The file that BLS used to construct these research data series on nonprofit organizations was downloaded in March 2013 from the Statistics of Income website and contained 1.53 million records.5 Approximately 1.05 million of these records are classified as 501(c)(3) organizations. BLS created nonprofit research data by combining existing QCEW and IRS databases. This data creation process included two phases. The first phase compared the EINs from the IRS nonprofit database with the EINS from the QCEW database. Only records identified on the Exempt Organization Business Master File as 501(c)(3) organizations were selected. When a match was obtained, all private sector establishments associated with this matched EIN were placed into a preliminary nonprofit database. Quality review checks were then performed on these selected establishments. BLS staff, looking for anomalies, scanned all matched records. Analysts compared data between the QCEW and IRS databases, looking for differences in the name, address, and functionality of each business. If necessary, the staff reviewed an organization’s website to obtain further information. Research on possible incorrect matches resolved discrepancies, leading to the record either being retained as a nonprofit organization or identified as an incorrect match and removed from the nonprofit database. If the record was identified as an incorrect match, it was placed in a “false-match” database to be retained for future exclusion. False matches may occur for a variety of reasons. It is well known that businesses can have multiple EINs and may use one of the EINs for various purposes, not always using the same EINs consistently. Data entry errors also may be a source of false matches. State Workforce Agency staff then reviewed a portion of the IRS–QCEW-matched record file. These state analysts performed quality checks on the matched-EIN data similar to those performed on the selected establishments. Any record that they identified as an incorrect match was added to the false-match dataset. The second phase in the creation of a nonprofit dataset was to identify nonprofit organizations that may have been missed in the EIN-matching process. Specifically, this step involved identifying unmatched records that are termed “reimbursables.” Under state unemployment insurance laws, some establishments are not required to submit quarterly unemployment insurance contributions. Instead, these organizations are allowed to reimburse the unemployment insurance system when a claim is made. The QCEW database includes a variable that indicates the reimbursable status of an establishment, which allows BLS to identify these records. Some of the records that EIN matched from the IRS dataset to the QCEW were reimbursables. However, for various reasons, not all reimbursable organizations file with the IRS and, as a result, are not listed on the Exempt Organization Business Master File. To include these missing organizations, analysts placed all private sector establishments in the QCEW database with a reimbursable flag in a separate file. Then records already paired in the EIN-matching phase were removed, creating a dataset of unmatched reimbursables. Establishments located in states which confirmed that a reimbursable flag exclusively designated a 501(c)(3) organization were retained as in-scope nonprofits. BLS sent the remaining 21 states a listing of all unmatched reimbursable establishments within their state. States reviewed business names and addresses and other information to indicate whether each business should be included as a section 501(c)(3) or not. Any unit determined not to be a 501(c)(3) was placed in the dataset of false matches. All other records were retained as in-scope nonprofits. BLS asked organizations in the nonprofit community to review all aspects of this project. Their comments and suggestions aided BLS staff in this first-time research and ensured that the project results would be useful to the public. After completing confidentiality training, outside experts from Johns Hopkins University and the Urban Institute participated in the review. An earlier report by Johns Hopkins University on nonprofit organizations excluded all records in the Commercial Banking industry (North American Industry Classification System [NAICS] 522110).8 After the Johns Hopkins and Urban Institute experts reviewed the microdata for this industry, they determined that, in many cases, these records were legitimate nonprofit organizations. As a result, this industry is included in the current QCEW nonprofit methodology. These research experts also helped identify false matches. Microdata records from all industries were reviewed, and any incorrect matches were added to the false-match dataset. Note: Percentages may not sum to totals because of rounding. In contrast to the steady growth that the nonprofit sector experienced, the total private sector employment, total annual wages, and the number of business establishments varied more with economic fluctuations. All three data series exhibited highly cyclical movements during the 2007–09 recession and the subsequent recovery. 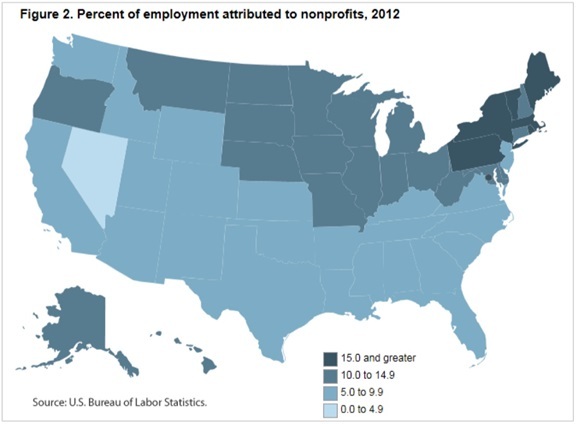 A review of national industry-level data for 2012 yields important insights into the nonprofit sector. The proportion of total private employment attributed to nonprofits within a sector varies considerably from industry to industry. Nonprofits constituted 70 percent of total private employment in the educational services sector, the largest concentration of any industry. Healthcare and social assistance industry was the second largest (46 percent); followed by other services (17 percent); arts, entertainment and recreation (15 percent); and management of companies and enterprises (11 percent). A majority of nonprofits were concentrated in specific industries. At the national level, three sectors captured 90 percent of all nonprofit employment in 2012: healthcare and social assistance (68 percent), educational services (16 percent) and other services (7 percent). The healthcare and social assistance industry was composed of four subsectors, all of which contain substantial levels of nonprofit employment. The hospitals industry (NAICS 622), the largest subsector, accounted for 4.0 million jobs, over 35 percent of all nonprofit employment. This finding is followed by social assistance (NAICS 624) with 1.4 million employees, nursing and residential care (NAICS 623) with 1.2 million employees, and ambulatory services (NAICS 621) with 1.1 million employees. (See figure 3.) More than 98 percent of nonprofit employment in the other services sector was concentrated in the religious, grantmaking, civic, and professional services subsector (NAICS 813). This subsector included such diverse organizations as churches, philanthropic trusts, conservation groups, scouting clubs, and homeowners’ associations. This relatively low share of nonprofit employment allocated to healthcare in the District of Columbia is not the result of a lack of nonprofits in healthcare. A look at employment in the healthcare and social assistance sector shows that this sector employs 62,563 private sector employees in the District of Columbia. Sixty-two percent of these jobs (39,283) are in the nonprofit field, the fourth highest percentage for the nation. The release of private sector nonprofit data has been useful to the public and has provided valuable insight into the workings of the nonprofit labor market. BLS leveraged the existing QCEW data and combined them with publicly available IRS data to construct a much-needed measure of this segment of the economy. These data may prove useful in improving measures of GDP and productivity. Building on the Johns Hopkins methodology, the BLS research data enhance the public’s understanding of nonprofit organizations by including reimbursable organizations and the Commercial Banking sector, both of which were excluded previously. The resilience of the nonprofit sector during the 2007–09 recession demonstrates its importance to the U.S. economy. BLS welcomes comments and suggestions on these data. Comments can be submitted through the Business Employment Dynamics Help and Information web page. ACKNOWLEDGMENT: BLS is grateful to the Johns Hopkins University and the Urban Institute research experts for their time, expertise, and guidance on this project. This article was presented in its original form at the Monthly Labor Review page on the Bureau of Labor Statistics website. For an example of a study on section 501(c)(3) nonprofits, see Amy Blackwood, Katie Roeger, and Sarah L. Pettijohn, The nonprofit sector in brief: public charities, giving and volunteering(The Urban Institute, October 2012). Executive Office of the President, Office of Management and Budget, Sylvia M. Burwell, OMB Memorandum M-14-06 for the heads of executive departments and agencies on “Guidance for providing and using administrative data for statistical purposes,” February 14, 2014. See the “Coverage” section from the Technical Note in the First Quarter 2013 County and Employment Press Release. Personal income and gross domestic product statistics are generated by the Bureau of Economic Analysis. In addition, for more information on wage income, see chapter 5, “Employment and wages covered by unemployment Insurance,” Quarterly Census of Employment and Wages Handbook of Methods(U.S. Bureau of Labor Statistics, April 1997). For more information concerning tax-exempt data, see https://www.irs.gov/Government-Entities/Tax-Exempt-%26-Government-Entities-Division-At-a-Glance. For more information on the downloaded file that BLS used, see https://www.irs.gov/Charities-&-Non-Profits/Exempt-Organizations-Business-Master-File-Extract-EO-BMF. See state-by-state listing on nonprofit website at http://www.bls.gov/bdm/nonprofits/nonprofits_appendix1.htm. Lester M. Salamon and S. Wojciech Sokolowski, “Nonprofit Organizations: new insights from QCEW data,” Monthly Labor Review, September 2005, pp. 19–26. Lester M. Salamon, S. Wojciech Sokolowski, and Stephanie L. Geller, Holding down the fort: nonprofit employment during a decade of turmoil, Nonprofit Economic Data Bulletin 39 (Johns Hopkins University, January 2012). 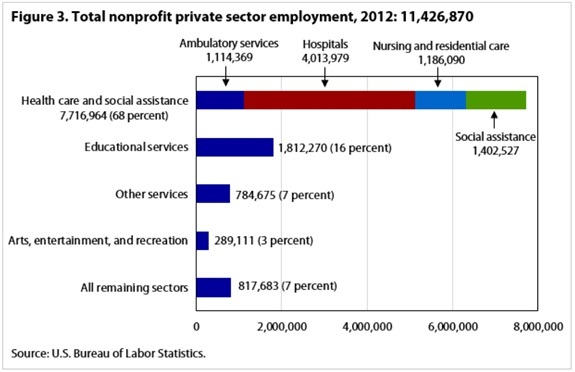 See additional data on nonprofit sector at BLS Business Employment Dynamics web page. Salamon et al. Holding down the fort: nonprofit employment during a decade of turmoil, 4. Erik Friesenhahn is an economist in the Office of Employment and Unemployment Statistics, U.S. Bureau of Labor Statistics.